Static GK is one of the important section in Government Sector and Bank related Exams. 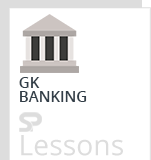 In the static GK, Banking is one of the important section. The article Bank Board Bureau presents the key points of Bank Board Bureau and different functions of Bank Board Bureau. The article Priority Sector Lending can help the students and aspirants to perform well in the exams like IBPS PO, SO, Clerk, SBI, RRB, etc. Government constitutes Banks Board Bureau (BBB) to Improve the Governance of Public Sector Banks. Shri Vinod Rai , Former CAG of India was appointed as the 1st Chairman of Banks Board Bureau . With a view to improving the Governance of Public Sector Banks (PSBs), the Government had decided to set up an autonomous Banks Board Bureau. The Bureau will recommend for selection of heads – Public Sector Banks and Financial Institutions and help Banks in developing strategies and capital raising plans. The government announced the constitution of Banks Board Bureau which will have three ex-officio members and three expert members in addition to Chairman. The Banks Board Bureau has its genesis in the recommendations of the Committee to Review Governance of Boards of Banks in India, May 2014 . There after, on February 28, 2016, the Government of India, announced the constitution and composition of the Bureau. The Bureau started functioning from April 01, 2016 as an autonomous re commendatory body. The objective is to help prepare the banks in the public-sector universe to take on the competition, have the ability to appropriately manage and price risk across business cycles, develop resilience to generate internal capital and have the capacity to generate external capital warding of the moral hazard in counting on the scarce budgetary resources of tax payers. The Bureau is also engaging with the Public-Sector Banks (PSBs) to help build capacity to attract, retain and nurture both talent and technology -the two key differentiators of business competencies in the days to come. While the Bureau is working towards attracting the best personages on the boards, it is these boards which should drive the overall strategy of a bank within its risk capacity and also act as custodians who should reconcile the diverse interests of various stakeholders . Banks Board Bureau (BBB) is an autonomous body of the Government of India tasked to improve the governance of Public Sector Banks, recommend selection of chiefs of government owned banks and financial institutions and to help banks in developing strategies and capital raising plans. In February 2016, the Modi government approved the proposal for setting up BBB and it started functioning from April 2016. The BBB works as step towards governance reforms in Public Sector Banks (PSBs) as recommended by P.J. Nayak Committee . Shri Bhanu Pratap Sharma is the Current Chairman of BBB . It is housed in RBI’s Central Office in Mumbai. To help banks to develop a robust leadership succession plan for critical positions that would arise in future through appropriate HR processes including performance management systems. To help banks in terms of developing business strategies and capital raising plan etc.